I wake up this morning to an email subject “FYI: Bonus Miles In Your Account” from American Airlines. 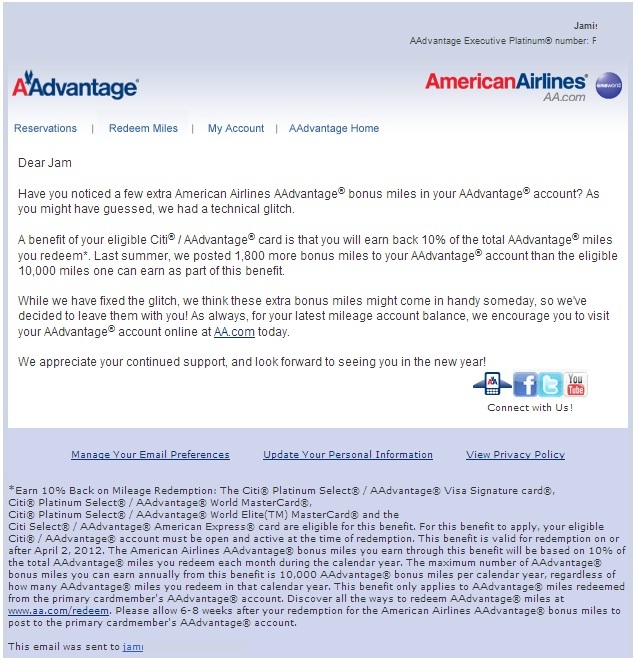 Have you noticed a few extra American Airlines AAdvantage bonus miles in your AAdvantage account? As you might have guessed, we had a technical glitch. A benefit of your eligible Citi/AAdvantage card is that you will earn 10% of the total AAdvantage miles you redeem. Last summer, we posted 1,800 more bonus miles to your AAdvantage account than the eligible 10,000 miles one can earn as part of this benefit. While we have fixed the glitch, we think these extra bonus miles might come in handy someday, so we’ve decided to leave them with you! As always, for your latest mileage account balance, we encourage you to visit your AAdvantage account online at AA.com today. We appreciate your continued support, and look forward to seeing you in the new year! I didn’t even realize that I had an extra 1,800 bonus AAdvantage miles in my account since it was buried under numerous AAdvantage activities on my mileage summary. I decided to look back and concluded that they posted the 10,000 mileage once, then 900 miles in July, and then once more another 900 miles in my August statement. Having the Citi AA AAdvantage credit card along with being an Executive Platinum elite is definitely a perk and it’s why I will be aiming for top tier on American Airlines for many years to come. On the other hand, United Airlines is known to pull back bonus miles it accidentally credits to a customer’s MileagePlus account so this is a great PR move by American. Kudos to American for being honest and upfront with their customers. Have you received a similar e-mail? I received an 1,800 extra bonus miles. How many did you get? This entry was posted in american airlines on January 8, 2013 by jammanxc.